Family Day: All Things Gullah - Call to Artists! The Smithsonian Institution’s Anacostia Community Museum is organizing a special event, Family Day: All Things Gullah, on Saturday, July 23 from 11AM to 4PM (In the case of inclement weather, the event will be held on Sunday, July 24th). This is the close-out event for the museum’s current exhibition, Word, Shout, Song: Lorenzo Dow Turner Connecting Communities through Language. The event will be a last-chance viewing of the exhibition before it closes the following day on July 24th. It will be a fun-filled day for the whole family with live entertainment, storytelling, arts & crafts demonstrations and workshops, face painting, oral history presentations and a vendor’s marketplace. The event will conclude with hopefully the largest “Ring Shawt” ever recorded. This program is FREE and open to the public. As a part of the Family Day, the Anacostia Community Museum invites artists and crafters from the DC, Virginia and Maryland areas to apply to become vendors. Applications received by June 17th will receive priority consideration. To receive an application, please email Soyini George at georges@si.edu or call 202.633.4807. DC Craft Mafia Spring Thing - TOMORROW! Spring has officially sprung. 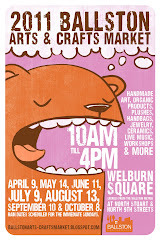 The DC Craft Mafia Spring Thing is TOMORROW - Saturday, May 21st from 11 AM - 5 PM, you don't wanna miss it! 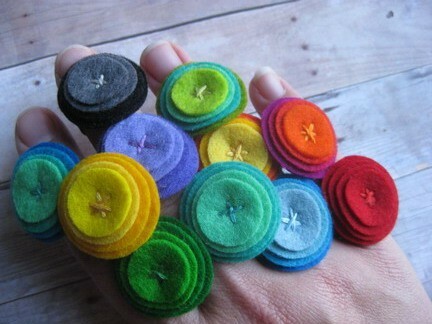 Join us and more than 40 talented artists and crafters at what's surely to be an exciting day. We'll has a couple of musicians lined up, Fojol Brothers will be there and Lucky Dog Animal Rescue will be hanging out all day with an artist raffle and adoptable dogs looking for their forever homes. The weather is going to be beautiful this weekend, so join us for a glorious Spring day of arts & crafts near Dupont Circle in Washington, DC! 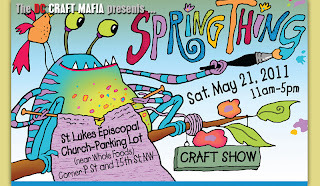 The Spring Thing will take place in the parking lot of St. Lukes Episcopal Church, only three blocks from Dupont Metro station. The Littlest Bean's work is driven by a curiosity about color, shape and texture. Using randomly cut fabrics, intricately cut felt, and an assortment of found media, artist Jen Menkhaus, creates one-of-a-kind accessories. Each piece is carefully hand-cut without a template, hand-stitched and embroidered. Jen notes that she loves it when her work makes someone else as happy as it makes her. Let Jen's artwork inspire a smile at the Spring Thing on Saturday, May 21st!